Add "inspiring a national crime wave" to your list of offenses committed by TLC. Thanks to the show Extreme Couponing, there's been an increase in newspaper-related crimes of late. Poynter reports that a woman in California was caught trying to return a stack of newspapers for being incomplete after pulling out the inserts in her car, and there have been similar incidents in Arkansas, Texas, Alabama, and Florida. Apparently TLC needs to run a disclaimer warning viewers that saving 50¢ on a 12-pack of Charmin isn't worth risking jail time. 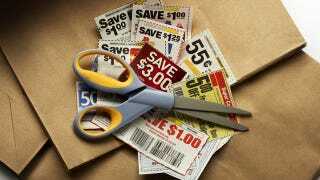 Is "Extreme Couponing" Even Worth It?